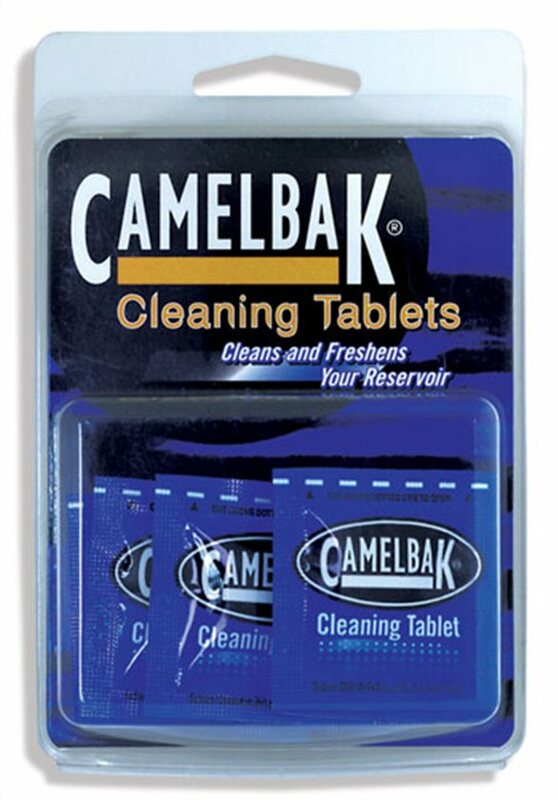 Keep your reservoir free from taste and odor and ready for your next adventure with the Camelbak Cleaning Tablets. They’re fast acting and are easy to use and work in just five minutes giving your reservoir a thorough cleaning. No more weird aftertaste or smelly odors! I have used these tablets multiple times. they do the job, but cost alot considering you can do the same for cheaper. Per the camelbak website 2tbls of baking soda/ full resivouir will freshen your pak. I'll recommend to use those tablets in order to clean the camelbak. Made my Camelbak like new again! No smell or taste, great product! As an avid camelbak user and less than eager cleaner.. I love this product! I often let water sit in my camelbak too long so I like to really make sure it's sanitized. I usually break a pill in half and use each half in a different camelbak. There is no after taste! Which is a huge plus for me. Just watch out because the water turns blue and I wouldn't want that to splash on anyone's clothes. These these are a bit expensive for what they are but the bottom line is that they work. Your bag will be clean. Just make sure you rinse the bag out REALLY well before you use it again.